Hi everyone. I've been reading this forum for a long time and i recently created an account. 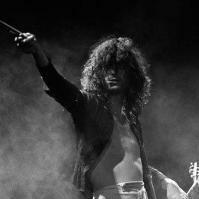 I enjoy all the twelve years of music that Led Zeppelin gave to us, and i am a huge fan of the 1977 tour. I see that the 77 tour gets slammed by some waterheads here and there, without a reason. I decided to rank all the 77 shows, to prove that most of them are good. THE ORDER IS RANDOM. I included only the shows that we have recordings for. I'd like to hear your opinions on my list. Yes. I don't think 6/22 is as good overall as people say it is, and the last two shows are kinda blah. June 27 is a bit rough and they are pretty tired . The 26th is. An above average show for 77 but it's just a good solid show with nothing that really stands out. Bonham is a little lack luster on the 25th but jimmy and Robert are on . I do think the 22nd is a better show then the 25th . I don't know if it's better then the 23rd or 21st but it's at least on par with them . You can find performance from the 22nd that top ones from the 22st and 23rd . It has the best version of over the hills and far way of 77 as well as the best imtod of 77. In terms of pages guitar playing and plants vocals it's hard to find better performances from 77. No quarter has a killer solo from page . The 22nd has one of the most powerful Kashmirs of 77 . Since I've been loving you is stellar as well. It's really hard to say how good the show really is because of the recording quality . Each of the first 3 shows In l.a have moments that top the other two . It definitely beats shows like the landover run Houston and fort worth . Houston is not near as bad as some make it out to be but I still find it to be pretty dull. Wow...please tell us everything you can remember since there's no (widely) circulating tape of it!! P.S. You mean 5/19/77, right? I wrote this about two years ago. I thought that the tape was not circulating at all. At least, if it circulates among the elite of fans, there is a lot of hope it will leak one day. Your post made my day! As far as I know, it does/did circulate amongst a very elite group of collectors. I think Nutrocker is probably the guy to ask for more details on that. If memory serves, a few people heard it before Freezer put the kibosh on its release...or something like that. Sorry to rain on this but for me the ‘77 tour was poor both performance wise-mainly down to Jimmy and Bonzo being out of it most of the time -and sound wise with some awful recordings. I think after the Earls Court shows things nose dived fairly spectacularly and didn’t really recover until Knebworth and the following European tour. For me the band peaked on the ‘73 tour with Jimmy especially reaching levels I’ve not heard from him since-in fact the MSG gigs are really him at the peak of his powers. It’s very telling that nothing from the ‘77 tour features on any official live release, so clearly Jimmy doesn’t rate those performances either. This is fair comment re: Page, but apart from San Diego, I'd say Bonzo kept it pretty tight in '77. He was out of it a lot, but it didn't affect his onstage performances imho. No. Not at all. The only reason for not releasing anything from 77 is because NO MULTITRACKS FROM 1977 EXIST. Jimmy has said it. Well that’s intriguing cos I’ve never seen him say that anywhere-have you got a source you can refer me to then ? 6. What exactly do you mean by "awful recordings"? Millard's recordings are bad to your ears? 4-28-77 recording sounds bad to you? 7. Someone who dislikes the 1977 LA shows (not to mention MSG, Pontiac and Birmingham) is either deaf or mentally ill.
Its been a long time since I read it on this forum. But I remember clearly reading that Jimmy was "unable to locate" multitracks from 1977. Oh and look at all the photos from '77. NO double microphones on the kick drum, Jimmy's amps and John Paul Jone's amps. Perhaps another member will confirm this. Well these are your opinions and you’re welcome to them, I however will take my cue from JP ( who is neither “deaf or mentally ill” ) and until he comes up with something he’s happy to sanction officially I stand by what I’ve said previously. If he has no multitracks, he is never going to release a raw soundboard. Unless he decides do make a matrix (audience + sbd recording). You are very rude. And your comment about the quality of the shows and the releases is the stupidest thing I have ever heard. "The only other thing that got loaded was something from a university that was done for a bit of a laugh, and it actually sounded too much of a laugh to actually wanna ever put that out and be measured up by it, because that was something that had a quite a few mistakes on it. We were playing numbers when we had just sorta recorded them and maybe played it for the first time and it was a lot to remember in the set. Consequently you’re gonna come unstuck a little bit. And it’s just something that will never see the light of day. That’s all there is. There’s just one other performance. Everything else is now out that we had live-wise." Okay, he's talking about Southampton for the most part, but what is the "One other performance"? I guess you're lucky you didn't waste any money on going to any of the 1977 shows.